The following is a communication received and scribed by a magician working in the Cincinnati area. The writing of it was not achieved by individual effort. By the same mouth, O Mother of the Sun, is the word breathed forth and the nectar received. By the same breath, O Counterweight of the Heart, is the manifest created and destroyed. There is but one gate, though there appear to be nine, Mime- dancer of the Stars. How beautiful thy weft and web, a-shim- mering in the fire-dark of space! The two that are nothing salute you, Black Flame that moves Hadit! The less and less One grows, the more and more Pra-NU may manifest. Do thou now speak to use, the children of the time-to-come; declare thy will and grant thy Love to us! I hurl upon ye, Children of Heru! All ye who love the Law and keep it, keeping Naught unto yourselves, are ye a-blest. Ye have sought the scattered pieces of Our Lord, ceasing never to assemble all that has been. And in the Realm of the Dead have ye begotten from the Dead the Shining One. Ye then gave birth, and nourished Him. Thy Land of Milk shall have honey also, dropped down as dew by the Divine Gynander. The pleasure and delight lie in the Working, the Whole surpassing far the Parts together. The Lord of Parts is placed within His kingdom, as done by Beast and Bird. The land of Sun is open but to Children. Heed the Eternal Child - his Way is flowing-free, and suited to the Nature of your being. Behold, He spreads His pinions yet in flight, showering and shaking forth the Golden Light upon the hearts of men. And wherein doth He fly, and by what means? The Feather and the Air are His to ride, to bear him ever in His GO-ing. The pylons of the ages are unshaken, firmly are they Set. The Day of the Hawk is but seen its dawning, and will see its due measure according to the Laws of Time and Space. Then has the Vision failed? Do I behold Thee crookedly, thinking Thee to be Whom Thou art Not? She danced and whirled, scattering starlight in her silent laughter. I Am Whom I appear to be, at times, and then again I wear a triple veil. Be not confused! Above all, Truth prevails. I am the Unconfined. Who is there to say me nay, to say, "Thou shalt not pass."? Who indeed may say, "Thy time is yet to come", when Time itself is my chief serving-maid, and Space the Major-domo of my Temple? Indeed, O Voice of the Akasha, I am the means by which you speak. By the same mouth that breathes the Air, do words of doubt pour forth. In silence then, do know Me. For I am come with purpose at this time, to aid the Lovers of the Hawk to fly. The Greatness of the Gods in the GO-ing. When first ye fledged, Beloved of Heru, the shall which had protected long had broken. Upon the Wings of Will ye ventured forth, gaining strength and power as ye flew. Ye gained all knowledge of the Feathered Kingdom, whereby ye became as perfect as the Sun. The friends and teachers all became as brothers. The regal Swan, the Heron and the Owl - the Raven and the Cockerel did aid ye. The Beauty of the Hawk Himself was granted, the virtues of the Peacock, the Hummingbird and Loon. The Eagle did reveal her inner nature and the Mysteries thereof - behold, ye witnessed how, with her Lion, she became the Swan. And the Ibis of the Abyss did show the Knowledge. Ye flew, O Kings and Hermits! And ye fly even now, within the bending loveliness of NU. But there are those among ye, and below ye, who would snare your wings and drag ye from the sky. Look well within! Judge well your Heart! If ye be pure, it weighs no more than I. It will not bear ye down to the Abyss. For Gold is Light, but Lead is fatal unto flying - plumb your own depths, in Truth and in self-knowledge. If aught would hinder thee, it is thy doing. Behold this teaching now within the Temple. So saying, She-Who-Moves assumed the form of the great Black Flame, growing from the central shaft and billowing out into the Void. The Children of Heru beheld in silence, and listened to Her words form in their hearts. Behold! This lens of Stars now turning in Space before ye - men have named it well Andromeda. Through it I flow unto the holy Moondog, and thence to Ra, and thence to ye, O Priests. Ye must not rest content whilst in the Kingdom, but strive and so exceed in what is done. In Love of the Lady of the North, and in Will of the Prince of the South, do every thing soever. In the power of the Seven-rayed Star do ye comprehend the Beast. And from HAD of the Heart do delight in thy star-arched darling. Do all this, and then, pass beyond. Abandon aught that might distinguish thee from any other thing, yea, or from nothing. If the fowler would snare thee, leave thy feather-cloak a- dangle in his hand and soar naked and invisible beyond! But now! As priests within the Temple are ye here, as Kings, and Warriors, Magicians all. The Way is in the Work. The Hidden One of the Abyss now gives the two wherein is wrought the higher Alchemy: supporting Earth is Chthonos - learn it well, and all bonds shall be loosed for the Will's Working. Surmounting Spirit, there is Ychronos, whose nature is duration and the passing-away thereof. The two are one, and form the Kingdom's essence. Who masters them is Master of the World. They are the utter keys of Transmutation, and keys of the power of the other Elements. The Warrior-Priests received the Keys, and placed them within their robes, to hold them hidden well above their hearts. The Black Flame danced and dwindled, becoming small, a quill pen, plumed and pointed. There being naught upon which to write, one among the Priests came forth, and laid his body's skin upon the altar as living parchment. She-Who-Moves wrote thereupon a Word, but shew it not before him. In patience waited all the Kings and Hermits, assured full well of the final Understanding. Of old ye knew the knew of the Two-in-One conjoined. 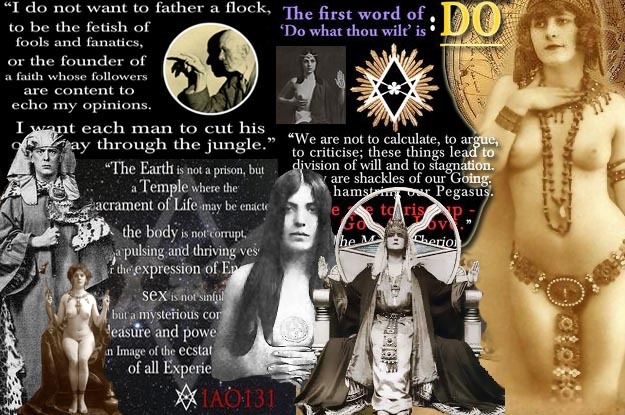 Ye have lived and loved full measure as NU and HAD, as PAN and BABALON. The Mystery of mine own image do ye also know, for such a Truth was for the ancient Orders of the East and West. Bipartite has the Race of Man been in its span. The Father and the Mother made a Child. I am the elder of the Children, true - but now the younger rises to His Day. The nature of true Alchemy is that it changes not alone the substance of the Work, but also changes thence the Alchemist. Ye whose Will it is to Work thereby, behold mine inverse image, and consider well its meaning for thy Task. From out the Yonilignam drifted forth a Cloud, violet and light-shot. In the misty heart thereof a sound arose, vibrating soft, yet filling everywhere. Jeweled and flashing rainbow-lights from wings, there hovered in the midst an humble BEE. Striped gold and brown, soft-haired and curved in form, it shone its eyes unto the Priests and Kings assembled. Spoke then She-Who-Moves from out the mist surrounding: This is the symbol of the Work-to-come. The Great Gynander in its Earthly form. The Magician shall grow like unto the BEE as the Aeon unfolds, a leader and sign unto the Race of Man. What then of its nature doth the BEE show forth? Behold, it is not male nor female in the singular. It labors forth by day in constant flight, an egoless do-er, whose Will and the Hive Will are but one. It gathers up the flower-nectar, flies to Hive and there, in pure Comm-Union, doth in its very body Transubstantiate. The Nectar is now Honey. Bee to bee, it is transferred, speaking all Hive Mysteries from and to each mouth. By the same mouth that first ingathered, is the Honey spent, the secret Alchemy within the Centers turning Silver - Gold. The Hive now lives, immortal. With queen and workers, drones and builder-bees, soldiers, foster-mothers - all are one. In constant life-renewal, the Hive breathes as One Being - for so indeed it is. In the Will of the Hive is the Will of the Bee fulfilled. Each in its appointed place, the Bees work out their Will in ordered harmony. The image fades. Now the poised Plume moves in dancing fash- ion, unfolding from the center shaft long wings, transforming to the shape of the dark Vulture. But know, O Children of the Hawk, a Man is not a Bee. He may profit from the image thereof, to learn of Wisdom in the Working. Behold in Me another image for thy heart's instruction. There rose before their eyes the Tower of Silence, wherein the Lovers of Fire lay their dead. The Vulture form alighted soft therein, and ate the flesh from corpses, to the bone. The wind howled, desolate, in this fearsome place, fluttering the cerements about the ivory bones. Silently, the Winged One stared, gore smeared about her beak. Into the eyes of each Priest there assembled, her baleful gaze did search. In perfect peace did they behold her searching., for each, as Warrior, had made of Death a brother. Deliberately then, she unfolded out her wings, and took to the wind, and soared up from that place. Eternity then reigned, Infinite the veil that hung about them. Somewhere, sometime, the veil parted for a moment, and She- Who-Moves strode forth. More comely than mortal woman ever was, She glowed in radiance of pearl and amethyst. Fine pleated linen was Her gown, girded in gold and silver, and on Her head, a nemyss of starred blue. Her crown was but a single plume, free-standing, and in her hands the Ankh and Wand of healing. Unto each Warrior-Priest she moved, embraced and kissed them. Then, seated in the midst, She spoke as comrade equally-ranked. "All ye who practice well the High Art, hearken. There shall be nothing hidden from thy sight. All formulae and Words shalt thou discover, being initiated by those whose Work it is to aid the Law of Will. "Ye have worked well in all that has been given; upon the Tree of Life are ye founded. In Tetragrammaton have ye proceeded; in all the Beast hath given have ye practiced well. Ye have become Hadit, and NU, and Ra-Hoor-Khuit also. As Heru-Pa-Kraath did ye abide in silence. Ye know PAN as lover and as god form, and BABALON is bride and Self to you. "The forces of Shaitan have ye engendered, calling forth the nexus of the ninety-three wherein to work your Will. Separation for the joy of Union have ye known, and Alchemy is Science to your Art. "For those who know, and will, and dare, and keep in silence, it goes not further. "In death is Life - for now as ever has it been so. The Willed Death is eternal - keep it so. Self of Ego, selfson born of Maya, must be slain on the moment of birth. The unsleeping Eye must vigil keep, O Warriors, for the illusion is self-generate. "Constant watchfulness is the first Act - the Abyss is crossed by minutes, every day. "If ye would dance the Mask, then mask the Dance. Exquisite must be the Art in this wise; and balance in the Center be maintained, or else ye shall give unwonted Life unto thine own creations. Tread carefully this path of Working, Mage. A tool, by Will devised, makes an ill master. "Now in the Mass, the Eagle must be fed upon what she has shared in making. By the same mouth that roars upon the mountain, is the word-act of No Difference given. "And when Will declares, therein shall join the BEE to add the gold to red and white. The essence of Shaitan is Nectar here, the Temple is the Hive. The Lion is the Flower, now betimes, the Eagle invokes the nature of the BEE. "Within the triple-chambered shrine is the first nectar pooled. The summons of the wand of PAN awakens the portal- opening bliss. And from the third and inmost chamber, in joy supreme, the Sothis-gift, quintessential mead, bounds forth to join Eagle-tears and Lion-blood. "Solve et Coagula. Comm-Union thereby, whereof the Cosmos itself dissolveth, and reforms by Will. And know, if aught can be so ordered in the Kingdom, that three or more is zero, as well as older truths." Then stirred the Warrior-Priests, and of their number, a nameless one stepped forth. "We know thee, Lady, unspoken though Thy name has been thus far. But say now - what was written on the manskin? What is the word Thou givest?" She smiled and drew from out her robe a parchment scroll, shaped even as a Star. Unrolling it, She turned it roundabout, so all might see. "What is this Word, O Lady - how may it be used?" "In silent wisdom, King and Warrior-Priest. Let the deed shine forth and the word be hidden; the deed is lamp enough to veil the face. "It is the word of the twenty-third path, whose number is fifty and six. It is the unspoken Abode, wherein the Dance of the Mask is taught by Me. Tahuti watches without the Ape; I am the Vulture also. "It is the Chalice of Air and Wand of Water, the Sword of Earth and the Pantacle of Fire. It is the hourglass and tail-biting serpent. It is the Ganges becoming Ocean, the Way of the Eternal Child. "It names the Source of Mine Own Being - and yours. It is the origin of this sending, that channels through Andromeda and Set. What race of gods do speak to Man, O Willed Ones? The word of them is both the Name and Fact. "It is for thee mantram and incantation. To speak it is to being about certain change. Be circumspect in its usage - for if its truth be known abroad, it would perchance drive the slaves to madness and despair. "Only a true Priest-King may know it fully, and stay in balance through his GO-ing flight. This is all I speak for now. The Book of the Preshadowing of the Feather is complete.